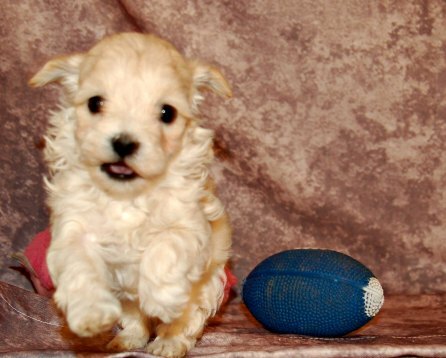 Your Perfect Puppy: How do you choose? So you want a perfect puppy from a litter of fur babies, but once you see all the puppies, it is so hard to choose: They all look incredible. On your first glance, they may all look the same especially if they all have similar coloring or may show little variation in behavior. But, a closer look will reveal some differences. First time puppy buyers (and even the most experienced) find puppies irresistible and choose their “perfect” healthy puppy because that one was the first to greet them, climb onto their lap, or give them that all familiar puppy kiss complete with the aroma of puppy breath. Sound Familiar? But is that really the perfect puppy for you? 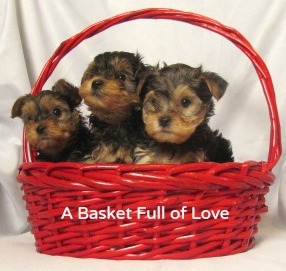 Chances are if you look a little closer, you will be able to notice differences, and if you are purchasing the puppy from a reputable breeder, she or he will be able to offer some help, but not always. For now, we are going to assume you have already interviewed breeders and have one you can work with on a long-term basis. We will also assume you have done a little research on the breed’s profile so you have an idea what the ideal dog should look like. A good place to start for this would be the American Kennel Club. 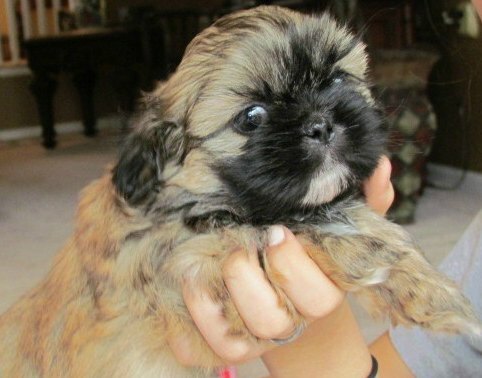 Unless you are buying a show potential puppy, you are not likely to get a “perfect specimen.” But you can get a good dog that is healthy and perfect for you. Now it is time to visit and observe the litter of puppies. It is always good to listen to your heart, or go on your instincts but to pick the perfect puppy; you need to consider not only the puppy’s health, but also the puppy’s temperament. 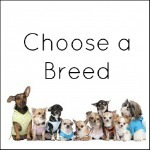 Within a breed, there is variation among dogs so do not assume that if you have your heart set on a specific breed, you will get a textbook specimen of that breed’s description. 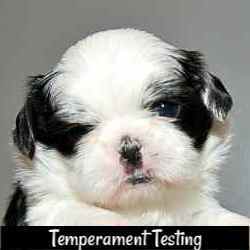 Within each breed there is a variety of behavioral traits, some more genetic in nature and others because of the puppy’s environment. There is no magical formula guaranteeing your new puppy will be healthy and well adjusted. We can look at a variety of factors that will help make your choice the “pick of the litter” for your needs. In this first part, we will help you pick your perfect puppy based on health. You don't need to have a degree in veterinary science to look at some of these factors that assure you are getting a healthy puppy. The physical health is crucial and even without a veterinarian present; you can assess the puppy for signs of good health. Of course, when you do make your decision, you will want a vet to examine your dog soon after you take him home. What are some signs of good health? A healthy animal should seem active and alert. Remember that puppies are just like human babies--they sleep much of the time. If a puppy just woke up from a nap, give him some to full awaken before making a decision. After all, even the best of us are not fully energized the second we wake up! Compare all the puppies in the litter for their level of energy. You will begin to see that some are much more energetic than others are. Pick a puppy whose energy level is compatible with your own. For example, a high-energy dog will need plenty of exercise to keep him happy. If you are looking for a lap dog, a less energetic one might be the perfect puppy for you. Look at the puppy’s eyes. They should be bright, clear. Discharge or redness on the whites of the eyes should not be present. There should not be a crusty accumulation of discharge dried on his hair below the eyes. Roll a ball or other object in front of him and notice if he sees it. If nothing is readily available, walk your fingers across the floor. Even if he does not chase after you or the object, he should still show signs of seeing the object. Look inside of the puppy’s ears. They should be clean and have no noticeable odor. Observe for any debris. There should be none. A puppy who can hear well will notice immediately if you clap your hands or snap your fingers. See if the puppy will let you look in his mouth. Young puppies will still have their baby or deciduous teeth and it is often difficult to determine what type of bite they might have as an adult. No puppy should have broken teeth or a bad odor originating from their mouth. If you have ever been around a puppy, you will know what I mean by “puppy breath,” and that is exactly how a puppy should smell. Look at the gums—they should be pink with no signs of disease or bleeding. His body should look healthy with just a little fat covering his ribcage. His belly should be round but not distended which might indicate an infestation with worms. There should be no caked feces on this rear. Look at his belly. Does he have a hernia or swelling where his umbilicus was located? Healthy puppies should not cough or sneeze. Their breathing should be quiet and regular. His nose should not be crusty and you should not be able to see any discharge. Cold Wet Nose? No just kidding. People used to think that dogs were healthy if they had a cold wet nose. Healthy dogs should not have a noticeable discharge from their nose especially if it is thick or colored. His coat should be clean and bright. There should not be any greasiness, baldness, or dandruff. There should be no sign of parasites such as fleas or ticks. If it is a long coated breed, there should be no mats or tangles in the hair. The skin below the coat should be clear. If you grab a small bit of skin and release, it should return to normal almost immediately. Watch how he walks and runs. There should be no limping or favoring any leg. If you are viewing a very young puppy, say one who is five or six weeks old, his gait will not be perfect. After all, he is still learning how to walk, so expect some awkwardness because he is still a toddler at this age. 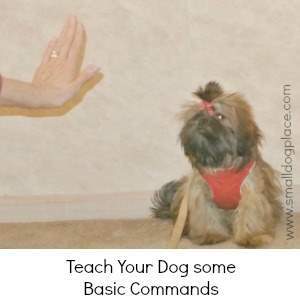 If you are looking for conformation, you will need to study your breed’s standard for specifics on structure and movement.